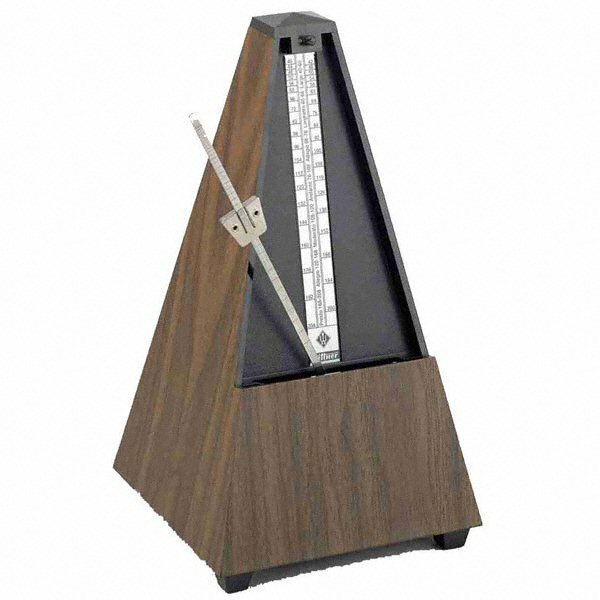 A metronome is a small mechanism that keeps time for musicians. Over the course of the last two hundred years, this technology has transformed dramatically from a brick-sized pyramidal stand with a weighted pendulum to a download-able application for a smartphone. Metronomes allow musicians to decide on a tempo (speed expressed in beats per minute) at which the music should be performed. The machine is used in rehearsals and private practice, and then is replaced in the concert performance by a live person, the conductor. The most interesting thing about this technology, however, is its origin; while German inventor Johann Maelzel is credited with this invention, there is significant evidence that he actually plagiarized the idea from Dutch competitor, Dietrich Winkel. Born in 1776 in Lippstadt, Dietrich Winkel was a famous Dutch inventor and instrument maker who moved to Amsterdam at the age of fourteen (Pianola Museum). Winkel studied the art of organ-building as a young man and produced his first (unassisted) instrument in 1810 (Pianola Museum). He quickly became world famous for his multi-cylinder instruments and a self-composing organ called a Componium (Pianola Museum). In 1814, he changed the face of music forever when he discovered a surprising new use for a weighted pendulum; keeping steady time (Piano). Winkel named his new device a “musical chronometer” and, eager to share with other musicians and inventors, donated the prototype to the Royal Institute of Sciences, Literature and Fine Arts (later renamed, Royal Netherlands Academy of Arts and Sciences) in Amsterdam. Due to either poor judgement or false faith in his colleagues, Winkel decided not to patent his idea and stood silently by as it was almost immediately plagiarized by German inventor Johann Maelzel (Pianola Museum). In the remaining twelve years of his life, Winkel continued to sell high quality musical instruments, but would never receive widespread recognition for the invention of the time-keeping machine (Britannica). Johann Maelzel was a famous German instrument builder and inventor from Regensburg. In November of 1814, Maelzel traveled to Amsterdam to showcase (and presumably sell) his latest invention, a self-playing organ he called the “panharmonikon” (Pianola Museum). During his visit, he witnessed a demonstration of Winkel’s “musical chronometer” and was inspired. In 1815, only a few months later, Maelzel added a graduated scale to the device (affects the speed of oscillation), renamed it a “metronome,” and patented it under his own name (Enclyclopaedia). Initially, he produced only two hundred of the machines and sent them to his musical acquaintances (including Ludvig van Beethoven) for suggestions (Piano). The following year (1816), Maelzel founded a metronome-building factory in Paris and began to mass produce the machines (Encyclopaedia). FUN FACT: According to Encyclopaedia, the “M.M.” before tempo markings on sheet music stands for “Maelzel Metronome”. Since its invention in 1814, several pieces of music have been written to simulate or include the metronome. The second movement of Beethoven’s eighth symphony (1812) was supposedly inspired by the repetitive ticking of Maelzel’s invention (Encyclopeadia). Tom Service of The Guardian, describes the work as “one of the shortest, weirdest, but most compelling symphonies of the 19th century” characterized by musical questions, “radical” structure, and harmonic tension. One hundred and fifty years later, the Hungarian-Austrian composer, György Ligeti wrote Poème symphonique (1962), for 100 metronomes. Chris Morrison of All Music, describes the disastrous premiere performance of the work at the Courses and Concerts of New Music of the Guadeamus Foundation in Hilversum (Netherlands), a very prestigious event apparently. Ligeti, unaware of the formal nature of this event, set up his metronomes, each at a different tempo, and acted as the conductor for the work. The audience, understandably caught off guard, reacted to the performance with loud protests and anger. As a result of the embarrassing events, the Hilversum Senate requested that the television special for the concert be cancelled. “Metronome.” The Editors of Encyclopaedia Britannica. Encyclopaedia Britannica. Encyclopaedia Britannica, Inc. 11 September, 2017. Web. 3 January, 2018. “History of the Metronome.” Editors. The Piano. SGMusic Pte. Ltd. 2015. Web. 3 January, 2018. "Metronome." The Concise Oxford Dictionary of Music. Encyclopedia.com. 3 Jan. 2018. Limited. 11 February, 2014. Web. 3 January, 2018. Pianola Museum. N.p. N.d. Translated to English by Marina McLerran. Web. 3 January, 2018. Music. All Music. N.d. Web. 3 January, 2018.